On Tuesday, America can take pride in a special transfer of power as Barack Obama becomes the first African-American to be sworn in as president. Shortly after the ceremony, the new president’s aides will slip away to inspect the offices they now inhabit. They’ve put much of their lives on hold to take jobs that will last, for most, two or three years. Hours will be long, pressure unrelenting, decisions momentous, and families often neglected. Every American should respect their sacrifices. What these aides will soon realize is that they aren’t history, but passing through it. I learned that from an elderly man who told me “to honor the house” as he emptied my trash bin late my first day at work. That is what an administration owes the country. But it is not all it owes. There is also the matter of governing. Team Obama is about to learn that it’s easier to campaign than to govern. In fact, they are already learning it. Last February, Congress passed a stimulus bill, adding $152 billion to the deficit. Mr. Obama called it “deficit spending” and criticized the “disdain for pay-as-you-go budgeting” in Washington. Now he forecasts trillion dollar deficits on his watch. Mr. Obama, the candidate, criticized the “careless and incompetent execution” of the Iraq war. But as president-elect, he decided to retain George W. Bush’s defense secretary and put a Bush adviser in charge of the National Security Council. Mr. Obama also tripped himself up by sending advisers to Capitol Hill on Dec. 18 to say that he wanted a stimulus bill to cost between $670 billion and $770 billion, but that he would accept $850 billion. This invited Congress to roll him and spend more. Now he may see not only his number shredded but the elements of his package as well. The last time the United States elected a Democrat as its president to govern with a majority-Democratic Congress, an immediate fracas arose over gays in the military, reinforcing a partisan story line that Democrats can’t be trusted with the nation’s security. 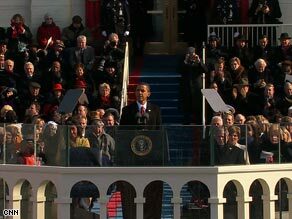 Sixteen years later, some will certainly be watching how deftly President-elect Barack Obama salutes, or how House Speaker Nancy Pelosi and Senate Majority Leader Harry Reid say the Pledge of Allegiance. These are symbols, of course, but the national security challenges the nation faces now are anything but symbolic: two wars, an ongoing terrorist menace, a growing list of unmet military needs and a long roster of other threats arising from new quarters. So it’s natural to ask: What do the Democrats need to understand about the military? And what does the military need to understand about the Democrats? As someone who has labored in both camps, I offer some thoughts. Let’s start by facing the truth: Democrats have long had an ambivalent relationship with the military, and vice versa. While Democrats profess to like and support the military, Republicans usually win more military and veterans’ votes than Democrats, and no wonder: Democrats have been pilloried for supposedly wanting to cut defense spending, for being soft on America’s enemies and for wanting to use the armed forces for “social engineering” — code for letting openly gay soldiers serve. As one senior Army leader told me a few years ago, “The Democrats may be all in favor of using force in a crisis, but can you trust them to stick with us when the going gets tough?” Exit polls last month showed that voters who’ve served in the military went for the Republican candidate, Sen. John McCain, over Obama by 54 percent to 44 percent.